“This is me hiking (well, awkwardly taking a break at this point) Las Lomas (the Hills) de Lúcuomo, just north of Lima. 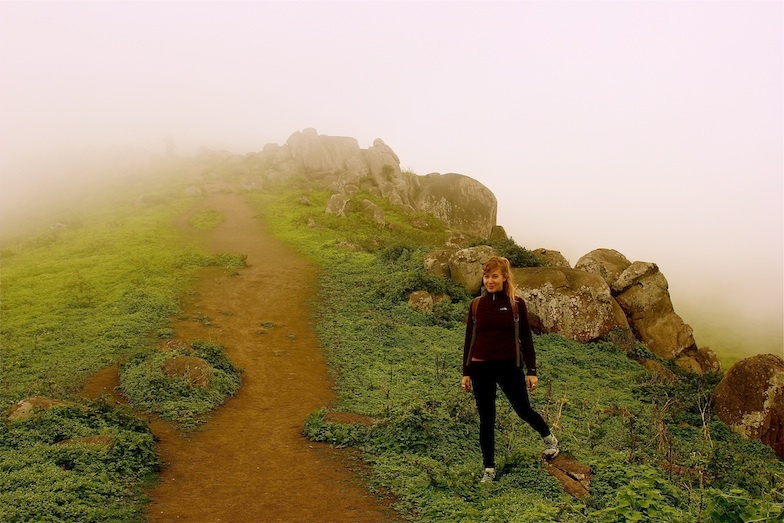 The blanket of smog – or “neblina” – preventing you from seeing the verdant peaks in the distance, only thickened the higher we climbed, seemingly leading us closer and closer to the edge of the world. Anyway, I promise it was more magical than this photo demonstrates. I’ve been here over a month now, but when I first arrived, being the only English-speaker at the office was definitely a challenge. Not even my semester abroad in Spain last year could prepare me for the initial strain and shock to my brain of completely relying on a language that’s not my own. But these days I rarely resort to frantic hand motions to communicate – and I think my brain generally hurts less too.